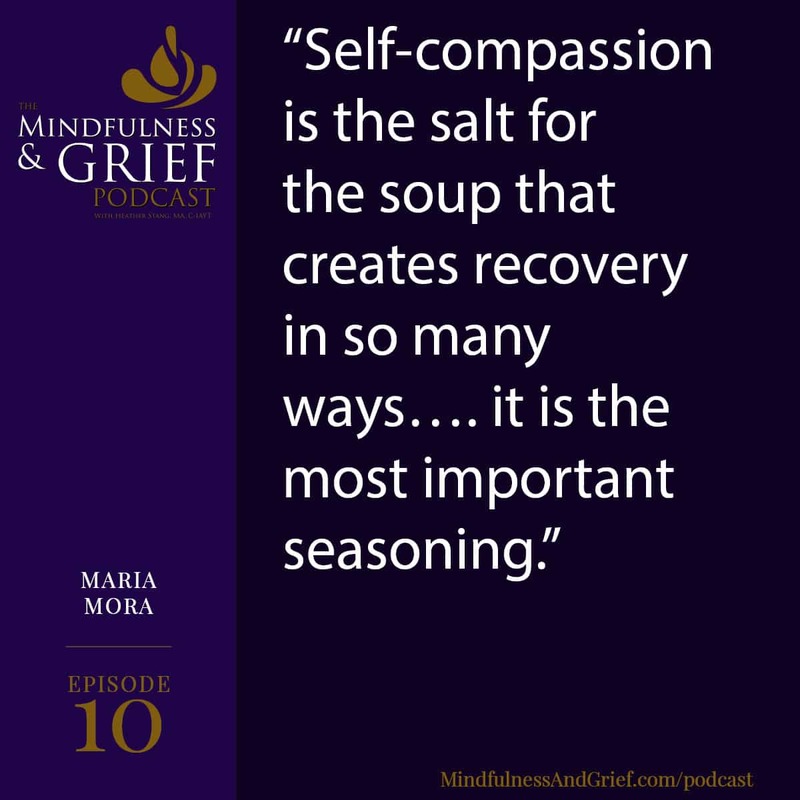 In the tenth episode of the Mindfulness & Grief Podcast, I interview Maria Mora, a Certified Eating Disorder Registered Dietitian. She shares ways we can help our body help itself by giving it the proper nutrition, and how we can use self-compassion to work with an eating disorder or disordered eating during grief. When we have had a major loss, nourishing our body can feel like a struggle. Many of us will feel nauseous just at the thought of food, while others will use food to distract from difficult emotions, or swing back and forth between the two. If you are dealing with an eating disorder or disordered eating, it can be critical that you give your body the food and self-compassion you need to create a solid foundation for healing. Maria is in private practice in New York City and Long Island. Learn more about Maria Mora and how she can help at http://www.integratedeating.com/. We start with structured eating, and the reason why is because many people coming to us with eating disorders do not have the structure in place. So whether it's a loose structure of 'eat every three or four hours' or if it's a more structured structure of 'here's what you're eating,' somewhere we have to start with structure. We need structure to create a good form of building our foundation. But then we use mindfulness and we use instinct as tools to create what we call mastery. We don't need to be perfect, but ultimately in order to recover, we have to be better than 'normal eaters' out there. I am the first to admit that I have a difficult relationship with food. I have been in recovery from bulimia for over thirty years, and during tough times it is very easy to turn to food for comfort. 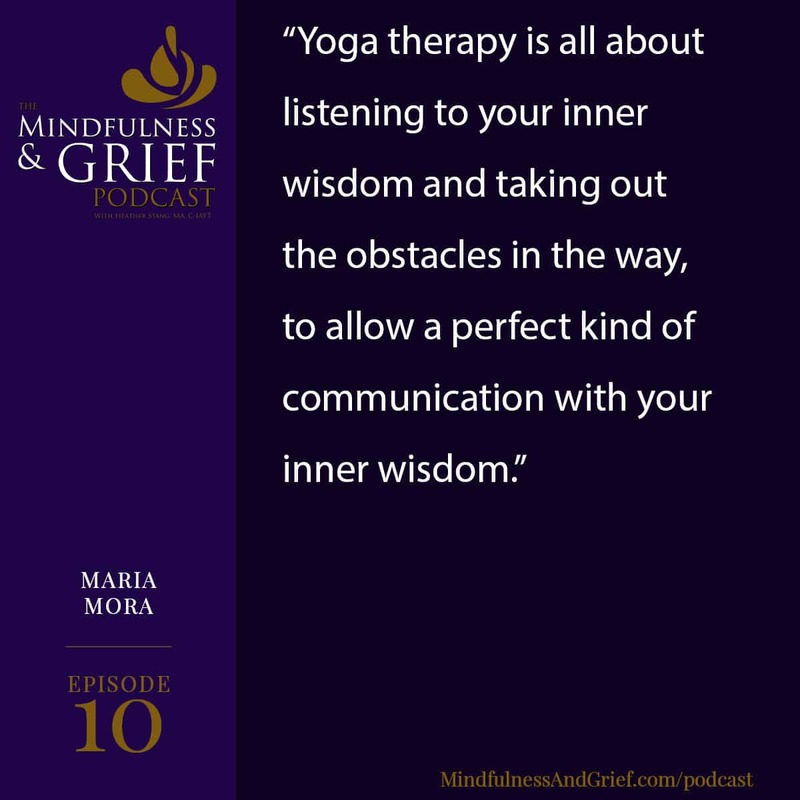 In this episode, Maria Mora shares some really helpful information about how the body reacts to stress - and we know grief brings a whole lot of stress - and what we can do to manage our eating disorder or disordered eating. ...everything exists on a spectrum, so do eating disorders and disordered eating, but beyond that and within that is our relationship to food and our relationship to our bodies. And if you have a body out there and you need food to make it work, you're going to have a relationship with it and towards it and around it. And so disordered eating and eating disorders is literally a disordered relationship with food and/or your body. Self-compassion is the salt for the soup that creates recovery in so many ways. There is no recovery without compassion…. The most important seasoning. This is true for all things we face in life. After all, there is no point in adding suffering to our suffering. Though we may do it from time to time, if we focus on helping ourselves, rather than berating ourselves, we will find the path a little less rocky. Maria is not only a Certified Eating Disorder Registered Dietitian, she is also a Certified Yoga Therapist, trained in the Phoenix Rising Yoga Therapy style as I am. She weaves the principles of yoga into her work. We know that yoga is more than the physical postures, it is the way we relate to ourselves, to others, to life. … yoga therapy is all about listening to your inner wisdom and taking out the obstacles in the way, to allow a perfect kind of communication with your inner wisdom. Take some time to listen to this podcast. Even if you do not have an eating disorder, it has some very good nutrition information that can help you manage your mood during grief. And be sure to check out Maria's web site at http://www.integratedeating.com. I hope you enjoy this episode, and welcome your feedback and reviews on iTunes, Google Play, Stitcher, iHeartRadio and YouTube. Subscribing, rating or reviewing the podcast will help it become more visible so others can benefit from these teachings. Opening: 00:04 The mindfulness and grief podcast offers compassionate insights for coping with grief and life after loss. I'm Heather Stang, author of the mindfulness and grief book, and your host for this podcast. Heather: 00:21 Welcome to episode 10. Today our guest is Maria Mora, who is like me, a certified Phoenix rising yoga therapy practitioner, but she is also a Certified Eating Disorder Registered Dietitian. Welcome, Maria. I really am excited to have you here on the show because it is really almost unheard of to be able to separate food and grief when we first get that news. We either, most of us stop eating for at least a period of time where we just feel like we can't even take in nourishment. And then sometimes we overeat. We stuff ourselves. We are trying to numb our pain, you know, and all of this is fine for a short period of time, but when it goes on and on it can cause a lot of suffering. So many of my clients have brought this up as an area that they're interested in. So I, I'm excited to hear your perspectives, your guidance, your advice, and so welcome to the show. Maria: 01:31 It is so nice to be here. Thank you so much. And yes, I agree with you. I think, you know, if you close your eyes and you think of something that many people remember about periods of their grief and loss, it is either food brought to them or a place that they went to in order to kind of distract, right? I remember a story of a woman who I work with who had lost a parent in a tragic accident and she remembers a family member literally giving her ice cream and saying you will feel better each. Or taking her to the diner to kind of get her out of the house and later on in her life realizing that these are the foods that she ultimately was bingeing and purging on and her understanding of how her grief became the food and the grief kind of melded together in the memory format that she had to work through and process. So I agree, it's so interlaced. Heather: 02:40 One of my friends, another, another dietitian had said to me that grief, the grieving body feels afraid, feels fear and fear craves fat and salt and sweet and, you know, even outside of grief, I think many of us feel that way because anxiety is prevalent in our culture. But with grief especially, and I wonder if, like you said with your client, this is something that happened when she was much younger, but then decades later she's realizing that her, her disordered eating is kind of tied back to unresolved grief. Just kind of interesting. So can you just, for those of us who are not Certified Eating Disorder Registered Dietitians, explain the difference between an eating disorder and disordered eating? Maria: 03:34 Sure. Well, I think the way to really start first is to know that everything exists on a spectrum, so do eating disorders and disordered eating, but beyond that and within that is our relationship to food and our relationship to our bodies. And if you have a body out there and you need food to make it work, you're going to have a relationship with it and towards it and around it. And so disordered eating and eating disorders is literally a disordered relationship with food and/or your body. And now I'm going to kind of a little bit contradicted myself by just saying a lot of the things that we do very normally in "normal eating" can be part of disordered eating, right? We've all eaten a pint of ice cream on a Friday after a really long day. Right. We've never skipped a meal or snack because we had a really big presentation either. Heather: 04:36 Actually, that's funny you brought that up because I had to make sure I sat down and ate my lunch before our interview. I was like, I understand my own food habits. My tendency to skip and say, oh, I'll do that later. That's right. But then saying why? Why wait? What's that about? Maria: 04:54 That's right. And that is all part of, again, a healthy relationship with food and a responsible relationship with food. And so the disorder pattern, again, I think a lot of times comes very innocently as a way of putting other things first. And I think the idea of when you're experiencing grief or loss, things feel so out of control. The one thing that you can control is your body. And so the question is how does that control happen? And under what circumstance does it happen in. And like you mentioned before, there are kind of a couple of different components of how grief and eating disorders are related. You can have a predisposition to an eating disorder or a history of an eating disorder and then have like the trigger, the kind of perfect storm of triggering that will surface and eating disorder around this time or this idea of a grief response or a trauma like you were mentioning in the very beginning, there is that fight or flight or freeze, that sympathetic nervous system response and reaction where your body is pumping out so much. So many chemicals that the last thing it wants to do is eat or have an appetite. And then there's the flip side of using food as a coping mechanism to either numb out the pain or starve out the pain or stuff them down. Right? And so food is used in all of these ways? And not eating is also used in those ways. Heather: 06:32 And often times it's not really conscious. Maria: 06:35 No, not at all. I will give you a scenario of somebody that our center is working with who in recovery for an eating disorder, but she had a loss of her grandmother and noticed that we noticed that she was losing weight and so we kind of said, hey, you know, what's going on, we understand you're in a grieving process, but now we need to address this and we need to look at the ways in which your body response is causing your body to not, not to get the right nutrients. And as nutritionists, as people in the field, we are advocates of the body and we have to feed the body the physical body, even when the emotional body is suffering. Heather: 07:25 And if you don't eat, that can really impact your mood as well. And many people, I don't know the exact percentage, but I've heard that it's kind of the 80/20 rule where about 80% of people will lose a lot of weight and not want to eat in the early months of grief. Whereas 20% of people will gain weight and overeat. And then that often reverses where the people who were starving are not feeling like they could eat for the reasons, the wonderful biological explanation you offered us, that stress response. Then it flips over to the other side where weight gain happens. Now this isn't abnormal, this is a, this is what happens. But I think what we're doing here is trying to have some mindfulness around caring for the body. Because as you said, and I say that all the time, there's so much with grief you can't control, but the things you can control are often how you tend to your physical body. Bringing awareness that you first remember you have a body. Because grief is such an out of body experience, so even to I have a body and this body needs food. Can you talk a little bit about how what we put into our body impacts how we feel since no matter what, when we're grieving, we're going to feel awful, but what can we do to make it - to not compound that. Maria: 08:59 So we have our concrete tools and then we have our not so concrete tools as nutritionists, right? When we're working with individuals and our concrete tools are to remind our clients and our patients to eat metabolically, to eat within the first hour of waking up and to eat every three or four hours after. I call it the one-three-four. One-three-four Rule: eat within the first hour, eat every three to four hours after that. That will maintain blood sugar and make sure that those kinds of highs and lows are not getting involved in your already kind of intense process, right? The last thing we need when we're grieving is to also have our blood sugar towards our feet so that we don't know where our mood is coming from and we don't know what it will take to kind of create balance. Maria: 09:46 So eating every three or four hours is really important. Making that move towards eating within the first hour is also helpful. I know that certain people experience panic or anxiety in the morning and they actually can't eat or they feel nauseous or they even feel like they want to vomit sometimes. I suggest to people to have, you know, two or three ounces of juice just to get the body rolling and then to try again, to offer again. Heather: 10:15 So it doesn't have to be a full Thanksgiving meal here, because I've talked to so many people and I've experienced it myself where you go to sleep, you finally get to sleep if you're lucky and then you wake up and you've forgotten that the loss has even happened, and then all the sudden it hits you. And the loss is a reality. Eating is the furthest thing from your mind. But that is a really helpful to have to say, it just has to be a few ounces of juice to get started. It doesn't have to be go eat a Bagel or a fruit bowl or something. Just get something into your body. Maria: 10:51 That's right. Studies show us time and time again. Something is better than nothing and with blood sugar, we don't want to maintain or remain in a fasting state for too long and I think you raise a really important question, a really important issue around which is sleep, which is another thing that gets so disrupted in loss and in grief and so on. Top of this, we have a body that is trying to figure out how to rest, how to recharge, how to regain energy when you're not sleeping. We have two ways of gathering energy in our body. We either rest or we eat for energy and so when your body is not resting, those cues for eating might increase because it needs to figure out how to get more energy in. Heather: 11:40 Wow, that makes perfect sense. But something I've never thought about before. I think I, I'm going to confess something here. I think I've had a story in my head and and I'm very good at sleep. I like to think of myself as the queen of sleep, but when I don't get sleep, my story is I was up longer, I was burning more calories, so that is not the case. I'm actually up longer and I'm craving food more. Maria: 12:06 Yes, and your body is just doing the next right thing, which is trying to put more energy into the body to figure out its needs while it's written. Needs might really be rest and recharge. Yeah. So from that perspective, it's like the body's trying to be your ally. It's doing the best it can, but it doesn't maybe always help us make the best decisions. Maria: 12:33 And remember, our bodies are so multifaceted, right? We have our, we have our physical body, our emotional body, and a lot of times there's a pull to take care of one over the other and in a grief or loss situation we're tending to our emotional body, sometimes at the expense of our physical body and yes, I think it, like you've said over and over it is natural and normal. Like this is a response. You kind of can't control the sympathetic nervous system in a, in a trauma response, right? Try to corral that it's impossible, but you can be aware of it and then you can be responsible for your part of managing the physical needs as well as the emotional needs. Heather: 13:17 Well let's hone in on that emotional need piece because one of the things that I think helps us with grief, but not all of us get the opportunity to practice it or it can be incredibly hard, is the idea of self-compassion. And where does self-compassion play in to the idea of disordered eating or eating disorder? Maria: 13:40 Everywhere. It's the salt for the soup that creates recovery in so many ways. There is no recovery without compassion. I talk from a recovery setting because this ultimately is where we're all going. Like I said, we are all recovering from something, and we're all transforming in that way. And so self-compassion is the humanity that in a lot of formats, the eating disorder just doesn't allow room for. And in a sense the eating disorder can grow in the absence of self-compassion. The first day when you were saying when you were asking the question, the first thing that jumped into my head is body image disorder, body image distortion, and literally the variables that interlace between self-esteem and body image disorder, and the willingness to be able to be in perfect in our imperfections and look at lessons, instead of we failed or we succeeded. And so self-compassion is for sure the salt, the most important seasoning. Heather: 15:03 I love that. That's an absolutely beautiful image. Maria: 15:07 And a food pun also. Heather: 15:11 It is. I pictured this really nice healthy vegetable soup that's healing and full of nutrients, which, hey, that might be a good start when you having trouble digesting things, but in working with your clients at your center, how do you address self-compassion. I know that you like me or yoga therapist and so that's a huge part of what we do and I'm curious to hear about the intersection of those two in terms of working with people. For those who are listening, do you have any guidance on how to work with that very difficult topic of self-compassion? Maria: 15:54 Well, there are many, many ways that we work on it and we can work on it in the nutrition office. On a one-on-one basis, as we're working with food, to remind a person who might come in with their food logs or who might say, "you know I keep doing this 'blank' behavior." To say, "of course we're going to do it until we don't do it anymore." Right? How can we bring, how can we bring our understanding of our, of our needs again, feeding an emotional need over a physical need and understand it's going to take time. You know, Rome wasn't built in a day. Recovery happens through experience and time, not because of one behavior that we do today or tomorrow. I think the way it filters into the yoga therapy, I mean you know the type of yoga therapy that we do and how we do it, in how it's all about listening to your inner wisdom and kind of taking out the obstacles in the way, to allow a perfect kind of communication with that inner wisdom. So that's a lot of work that we do. Trust, trust. And then, you know, just from the yogic background, I love using the yamas and niyamas as a center point for recovery and interlacing the ahimsa (nonviolence), and how to use nonviolence in your recovery or in your eating or how you treat your body. How to use satya (truth), how do we become truthful around our eating experiences and so on and so forth. Heather: 17:38 So there's a lot of mindful wisdom in this process, and it sounds like one of your points is rather than coming in with a food log and you showing that you, you know, you maybe ate in an unskillful way for five days in a row, rather than saying like, "I'm a failure, I'm doing this wrong," it's using that as information and then asking the question, how can we do this differently during the next five days or during the next period of time rather than shaming and blaming. Which I'm not surprised you as a practitioner, don't do that. But as human beings who go to a practitioner, it's really easy to beat ourselves up and to put that on ourselves. So you're stripping away that story and creating some space for some healing. Maria: 18:31 And also, there is an image of understanding eating disorders - that the eating disorder was there as a survival technique. It is the thing that you latched onto as a buoy, and unfortunately the buoy has started to allow you to drown, right? So we have to be able to almost look at the disorder, that behavior as an understanding that that was the best that we could do at the time we did it and it actually was self-preservation, and we have to kind of honor it and accepted, but also realize that the same strategy over and over might cause destruction, destruction of body, of relationships, and that we how to, how to be able to go forward without using the same strategy over and over when it doesn't work any longer. And so we have to use that letting go technique, right? Letting go of what no longer serves us. Heather: 19:34 Recognizing the impermanence of all coping, all maladaptive coping skills. Just because you're doing it now doesn't mean you have to do it forever. Maria: 19:44 Or that it will work. Heather: 19:50 In thinking about things like trauma, posttraumatic stress disorder, that's the body trying to do it the best it can in a really awful situation, that then left unchecked. It becomes a problem. So I like that idea of honoring this was the coping mechanism you had at the time, but how do we, how do we step away from it? Just shift gears a moment and this is something that so often comes up and that is alcohol, and how alcohol affects the body because we know that for a short period of time a little bit of wine might be able to make us feel better, but what are the longer term ramifications of that I have to remind myself of, because I know I have a tendency to use that to numb myself out. I remember when my stepfather died, the first thing I think I consumed was probably a glass of wine because that was "Here, this will make you feel better," but what I've learned through my mindfulness practice is that about six or eight hours later, I feel more anxious. So do you have any insight into using alcohol? Maria: 21:16 Well, that, that is actually what I say. I mean, again, I, I think about it from the terminology of what is actually happening in the body right? During these times. And so many people are looking for a relief from anxiety, or relief from depression, right? Both of those things, or sadness or longing. And so again, we have to look at this as "this is the best we can do in the moment," but I think you're right, and there is a really important fact about alcohol that we need to know. It's a toxin. And so when we put a lot of it into our bodies, our bodies have reactions and responses and our bodies let us know that it is a toxin. And we have all these ways that if we really look at alcohol, that it tells us, like a headache or we don't feel so hot or mood shifts or we don't have the energy to do the things that we need to do the next day. Alcohol also, you know, in turn interferes with um, with glucose, and so our blood sugars can get. Imagine not eating, having a glass of wine, and then trying to figure out how to feed your body four hours later. Heather: 22:27 It would probably be with something really amazingly fatty and salty. Maria: 22:32 That's right, because the body's way of getting nutrients in quickly is with carbohydrates that break down quickly, which are sugar, refined carbohydrates, and fat. And so again, the body is just doing somewhat of what we asked it to do. "Oh, you need us to get this into fit fast. How about craving this?" Maria: 23:51 Then I won't answer this question with broccoli. Heather: 23:53 I love Broccoli, but that is not what I'm looking for. What are some things you recommend that can help? Maria: 24:01 I think you'll like this answer, I'm not sure, but, and I agree with you when I want to say out loud like this is in no way point saying that there's no room for comfort foods. This is all a part of a process and we have to be willing to be in the process that we're in. Whether we got there in the way that we wanted to or not, or we asked for our process, we are in it. I think the best answer to the question is a balanced meal or snack and that really means, and there does not have to be a lot of science around this, but something that includes protein, carbohydrate and fat in little bits of little packages, like little cool nutrient dense packages, right? And that can be a peanut butter and a banana and that could be a string cheese and apple and crackers or it can be a sandwich or it can be passive meatballs. It's anything that has protein, carbohydrate and fat and a little more Broccoli maybe on the side. But that's certainly not going to change the scenario as far as I'm concerned. But the idea would be that you are giving your body actually what it needs at the time that it needed. And then the body kind of stops asking you for it. And that's a really nice relationship to have with the body. Heather: 25:12 So you're offering it a variety of things. And those three key elements. I liked the pasta and meatballs answer a lot, add some tomato sauce. It's got a little pasta, got a little meatball because that's. And I also like that you really kind of pointed out there. This isn't about blaming of food, like saying you can never have ice cream or you can never have popcorn or, you know, it's not a never. It's a conscious mindful approach to what you're putting in your body. Maria: 25:46 That's right. And speaking of mindfulness, I think this is another idea just to work with and you know, I think when you are, when you're aware that something might be going on in your eating, Oh wow, I'm eating really fast or oh I'm, I just mindlessly ate a bag of chips. One of the things that you can do cautiously but with great intent is bringing mindfulness to your eating, and that doesn't mean you sit with a raisin and smell it, and eat it, although that is wonderful. But another way of doing it at a meal is setting up an environment where there's not so much going on. Like you're not on your phone and you're not on your TV, you know, you don't have the TV on, but that you create a workable space. Right? Just like any other relationship, if you and your significant other were trying to have a conversation and they got on the phone and put the TV on, it would be really hard to connect. And so it's the same thing with eating. There's a connection part here that's so important. So making the environment kind of conducive to connection, right? Yes. The pacing is important if you know that if you see that you're eating quickly or not quickly enough, right? Like if you take a bite and then go run do an errand and come back through the three hours later, the fullness and we're not going to have the right responses. So mindfulness means bringing, bring yourself, bringing your senses and yourself to the table, metaphorically and literally. Heather: 27:22 And that also gives you a little bit of mindfulness practice worked right in. So not only is it a benefit to your, your metabolic system, but it gives you a break, because it's saying, come sit down, pay attention to what's happening right now. Pay attention to the flavors in your mouth, pay attention to how you feel as you're eating this and that helps you become your own best friend. That helps you to befriend your body as we like to say. Beautiful. So we've talked about the body's response to grief, the whole metabolic reaction, the stress reaction, why it craves what it craves. We've talked about ways to eat, which I love that it's not super rigid and forced and we don't all feel like we have to go home and change everything we do. Um, in your experience, how, how do you help us stay on track for the long haul, because like you said, there's a lot of our eating behavior that can be rooted in early traumas in life. And so what do we do if we have a pitfall? Again, you know, if we backtrack. Maria: 28:45 Well I think the first thing to do is to know yourself well, and to know what it is you need end to end to get the support that you need. So there are some pitfalls that feel like, okay, I know my plan, I know my story, I know how to do this. I just have to get accountable. And then there are times where it's like, no, I actually need to call my therapist, call my nutritionist, get into an eating support group. I think the long haul needs you and your inner wisdom to kind of connect and really understand the truth of the matter and to know that there's so much support out there if you need it. And this can be as literal as going to a nutritionist, for 10 sessions or it can be really diving in. Heather: 29:43 You have your fancy title that I'm loving learning about. How do we find a legitimate dietician, and not just someone who thinks they know how we should eat, thinks they know how we should care for our body, because when we're grieving, we're very vulnerable. It takes a lot of energy to reach out for any kind of help, and if you reach out and that person on the other end isn't going to offer you something helpful, it can, it can just add more devastation. I know you're in New York, so if we're in New York will come to you and we'll get your information shortly. But for those of us that aren't near the wonderful Maria Mora, where, you know, how will we find somebody? Maria: 30:32 Well, luckily we have we have an organization called the International Association for Eating Disorder Professionals. And if you go on their website, you will find a certified eating disorder professionals in your area. And there are many, many, right? When we go to national conferences and international conferences, there are so many by state and so many by city so that, that said, RD or that CED, that certification just just tells us they have the training in the specialty of eating disorders. It's always nice to have that. It's not necessary. There are wonderful clinicians out there that are not certified but are specialists. But you do want to do a little bit of interviewing. And I love the body of nutrition. I love all clinical people who do nutrition, but nutrition can vary greatly. Um, we have our nutritionists and they can be holistic in nature or they can be from other kinds of walks of schooling. And then we have our registered dieticians. Registered dieticians means that they either have a bachelor's or a master's in nutrition science. Um, those tend to be the people that you may want to find when you're working with a disorder. Not all the time. Certainly not a blanket statement. I do feel that you need to interview your clinician well and say, "have you ever worked with somebody with disordered eating or an eating disorder." If they say no, I think it is really important to consider somebody else. If they say yes, that's usually a good start. Heather: 32:15 That's really helpful. Even if you don't have an eating disorder, if you feel your eating is out of balance, a nutritionists can provide you with the information, the science to help you get on track so you can fuel your body in a way that it can survive. Maria: 32:41 And for support. I think a lot what we do is not nutrition education. Like we can do that in 10 sessions or less, but what we do is we hold, we literally are there to witness your process, to hold your hand and to remind you, "okay, so it wasn't a great week. Okay, let's make some intentions for how we're going to do this next week." Or "what have you learned from this symptom this week? You know, what is it telling you about how you manage your stress," because those are all really important things. Speaker 2: 33:10 I think right there. You just took away all my fears around nutrition, because it's not going to be "here is a list of what you have to eat," but it's going to be, "here's how I'm going to help you get to where you want to be in your life. Here is how we can help you live as full of a life as you can even during these dark times." And I would add just as somebody who works in grief, even asking your nutritionist, have you worked with someone who's been grieving? It isn't a bad question either because we know that when we're around people aren't comfortable with grief. It can make us feel even more alienated. So finding someone who has that intersection, even if it's their own experience of grief where there's, you know, some compassion there, I imagine it would be really helpful. Maria: 34:01 I couldn't agree with you more. Heather and I. I think the more I do this work, the more I understand that. Having an understanding of trauma is one of the most important things with eating disorders and whether trauma includes grief and loss, I think is so, so, so integral in our understanding of how the body responds to eating, and to the disordered eating patterns. Heather: 34:26 Well that makes perfect sense because the body's just trying to survive here. It is all it is trying to do. Heather: 34:38 Right? Yeah. And so you have to partner with it to not confuse it, by not sleeping, by not starving yourself, by not not finding that right balance and that will help your body help itself. And maybe you'll even crave a little bit of broccoli, which I do from time to time. I do feel bad - I hope that the Broccoli Association doesn't call, because I actually do love my broccoli. I just know that when we're grieving it can be a real challenge to just just want those things. So tell us a little bit about what you're working on. I hear a rumor that you are working on a book. Speaker 3: 35:18 I am, I'm in the final finishes of the manuscript. It's a book on integrated eating, which is the concept that I work with a holistic approach to eating disorder, recovery. And really what it is, is it takes people into an understanding of mind, body, soul. We need to invite all of us into recovery and we need to invite all of us into eating, to the eating process and we do it with a four stage process. We start with structured eating, and the reason why is because many people coming to us with eating disorders do not have the structure in place. So whether it's a loose structure of "eat every three or four hours" or if it's a more structured structure of "here's what you're eating," somewhere we have to start with structure. We need structure to create a good form of building our foundation. But then we use mindfulness and we use instinct as tools to create what we call mastery. We don't need to be perfect, but ultimately in order to recover, we have to be better than "normal eaters" out there. And that's the concept of the book. It's really taking an integrated approach and looking towards ourselves as masters of our own eating. Heather: 36:36 And that book comes out in the spring or summer of 2019. Maria: 36:42 That is correct. We will look for that. Do you have a working title yet? Maria: 36:49 Integrated Eating Approach to Eating Disorder Recovery, I believe is what we all decided on. Heather: 36:54 Okay. So we will look for, look for that in a few months or depending on when you're listening to this. It could already be out. And how do we find out more about you if people want to work with you on either eating disorders or disordered eating or yoga therapy. Heather: 37:54 Wonderful. Any final words of wisdom you'd like to leave our audience with? Maria: 38:02 You know, my feeling is feed your physical needs, tend to your emotional needs. And I think that if you can really discern the difference, you're in good shape. Heather: 38:15 Oh, that's beautiful. So "Phoenix Rising," too. I love that. Feed your physical body, tend to your emotional needs. Thank you, Maria. Maria: 38:27 You are welcome Heather. It was a pleasure and an honor and a privilege. Closing Notes: 38:37 Thank you for joining us for the Mindfulness & Grief podcast. If you found the information helpful, please help others find us by rating, reviewing or subscribing to this podcast, wherever you download your favorite shows. For additional grief support, including free guided meditations, visit us on the web at mindfulnessandgrief.com. And consider adding the Mindfulness & Grief book to your self-care tool kit. Special thanks to our sound engineer, Todd Campbell, of Hub City Recording, and to the Atomic Mosquitoes for our theme music. I'm Heather Stang and I hope these teachings will be of great benefit to all who received them. Until next time, Namaste.